Old Board Gamers Blog: TI Expansion preview and other news. For those that are interested in this upcoming expansion the first preview is up. Go give it a look. The first Nighfall expansion has also been announced it is called Martial Law. I really liked this game but I felt the base set was skimpy on cards. This is a stand alone expansion so I assume that means you don't need the base game. Fighting Formations is going to be released on April 7th. Of course by released I mean shipped to all the P500 customers like myself. 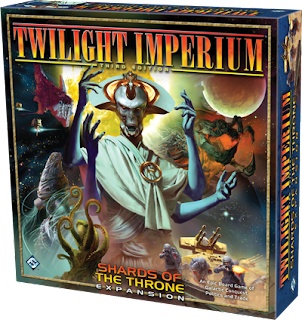 I'm very eager to get my copy as I really like what they are trying with the mechanics. This week is going to be kind of slow for me as I'm preparing for a trip so hopefully Chris and Todd can keep you entertained.